Battery Lithium ion rechargeable for MBITR AN/PRC148, Standard twist lock interface. 7.00AH CAPACITY . EU-Master MSDS available on request. This is a NONE ITAR product. 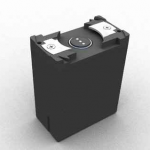 Battery Lithium ion rechargeable for MBITR AN/PRC148, EU-Master MSDS available on request. This is a NONE ITAR product.